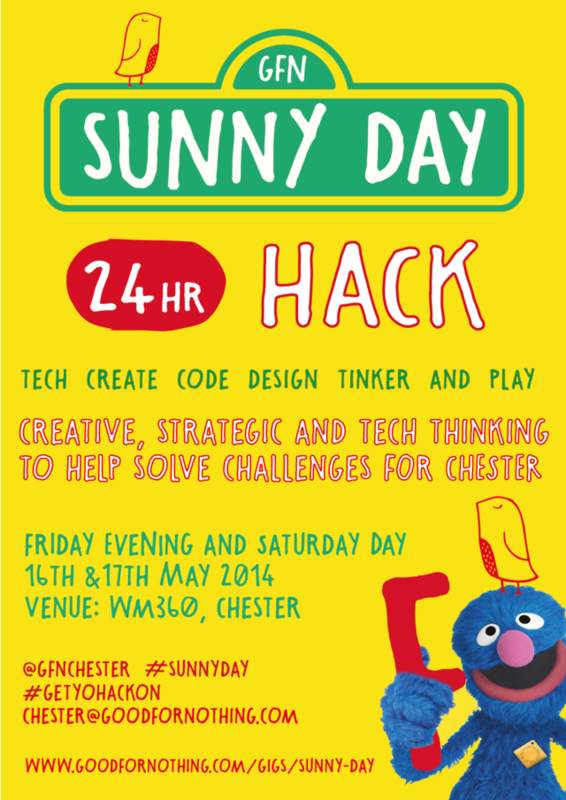 Good for Nothing Chester is doing cartwheels down the cobbled streets and singing up a Sunny Day in anticipation of our first "24 hour hack gig" on 16th and 17th May 2014. Our hack will start on Friday 16 May at 1900 when we'll introduce the chosen Ventures, and they'll talk through their briefs, brought to you by the letter F for food, farms and good old fashioned fun. Why? To bring sunshine, skills and talent to Chester's cause led innovators and change makers, to make Chester - and the world - the kinda inspiring place we want to live. How? Talented, experienced and like-minded creative, tech and design folk will be giving their skills for free to answer our Ventures' challenges. What? Good for Nothing is a bit like a house party but with people doing stuff rather than getting hammered. Music is a big part of the experience and so is great food and drink. Our Good for Nothing friends Robinsons Brewery, ShortList Recruitment and WM360 have donated space, music, food and drink to keep all of you good people going for 24 hours so watch this space to find out who to heap your love upon. The gig starts at 1900 on 16 May for your briefing at our lo-fi venue; King Charles' Tower. It's the inaugural event for the venue. How very Chester...off with our heads! Bring your favourite childhood game. Can you tell me how to get to GFN Chester? Friday evening is at King Charles' Tower, on the Walls, above Dean's Field and behind the Cathedral. For Saturday, friends at WM360 have donated their offices in Chester - so expect a sunny day, hard work, soft hanging and Fußball, natch. ✔ Space provided by WM360 . ✔ Tea breaks provided by WM360 . ✔ Food and Drink to power us up on Friday night provided by Joseph Benjamin . ✔ Coffee provided by WM360 . ✔ Beer! provided by Robinsons Brewery . ✔ Good Grub on Saturday provided by The Natural Veg Men paid for by Shortlist Recruitment Ltd .